So, what’s keeping you from jumping in? While it is difficult to confirm the number of women’s golf scholarships that were not awarded in recent years, it is estimated that more than 200 of the available women’s golf scholarships went unused. With the implementation of Title IX, colleges are required to have the same numbers of athletic scholarships for females and males. This provides a huge opportunity for young female golfers looking to play at a college level. Okay, so you may not break the same sweat as you do in spin class, but a good golf game can provide plenty of exercise. The average golfer is said to burn around 1,500 calories per 18 holes of golf. I have to say from experience that walking for five hours on the course while carrying a 50 lb bag on my shoulders definitely got me into shape. 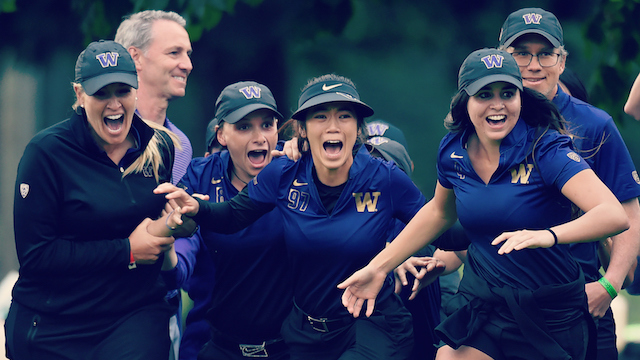 Golf provides a great opportunity for college women to get to know each other in a way they didn’t before – and form friendships around their common interest in the game of golf. I wouldn’t have met my two best friends if I join a college women’s golf league. There’s nothing better than gossiping and getting out a good sweat while golfing with your girlfriends. Golf fashion is big business and you’ll enjoy some amazing options from big brands like PUMA, Antigua, Callaway and Lady Hallagan..If you’re into fashion trends, this is the sport to get into. It opens up a whole new wardrobe world. It’ll be easy to look fashionable rocking those golf skorts, pink tank tops and bejeweled golf shoes while on the green.